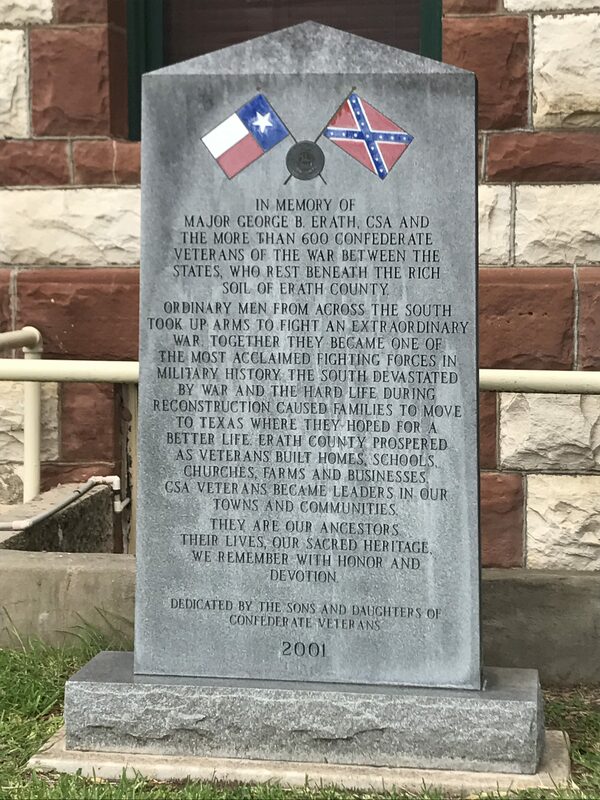 How do you feel about Stephenville’s confederate monument? Let us know your opinion by taking the survey below! Let’s not start this left-wing stuff in Stephenville. Go to Dallas or Austin if you want to cause division. Leave them alone. Why are they bothering now?? They have been there for years. This is crazy. I think you are just trying to stir up trouble and create news to report. HISTORY is already done. Moving monuments or destroying them does not change that. People need to learn from history to not repeat the bad and wrong. Embrace our past or it will become our present. You choose what can offend you. Choose wisely. Learn facts, not opinions or slanted views of history. Get both sides. Do not be a sheep led astray by emotion. Our history is how America became a great free country. Do not go backwards with ignorance. I think it should be left alone. It’s fine where it’s at now. No reason to waste people’s time just to move a monument. Leave it alone. Americans. Our ancestors, regardless of where they come from all faced their own hardships. The veterans that fought wars to bring our country where it is today, do they not deserve to be recognized? If you’re willing to relocate/remove one monument due to it being found offensive, then all monuments that recognize an individual that made any form advancement for any particular race, gender or religion must be relocated as well because those too can be found offensive. We are texas, we set standards for the rest of the nation. The monuments should stay exactly where they sit, from honest Abe, to MLK, to this small recognition piece. The monument has yet to be an issue until racial division across America became a new hot topic. You can not rewrite history. Please honor our history and do not attempt to change it. Take down statues of MLK (who I respected) and Obama (who I did not) and then I,will talk about removing Civil War history. Stop trying to erase history! There has been no debate except that perpetuated by Tarleton State. Leave the monument, as it is our heritage and history. These monuments across the country have been there longer than 90% of the population has been alive and no one was offended. Let’s stop pandering to a small group and grow a backbone, America. Honestly, removing a monument does what for this city? How many other by far more useful things could we be doing? I am not only a citizen of Stephenville, Tx. I am also a TSU Alumni. Please, Tarleton (students and staff) leave our community memorials alone. You have taken over our streets. Our businesses cater to your needs and wants. Please, let our community’s history and ancestors be honored the way WE the life time citizens see fit!! Please leave the monument where it is…on the beautiful courthouse square. George B Erath was a great man and he did what was asked of him as many of our ancestors have before us. This is our history and it is important to remember history. Please visit the Texas State Historical Association Online Handbook about George B Erath. All the historic monuments should be alone. They represent our history. Thank you. Confederates are losers! Why would you worship such a ridiculous flag that means only on thing, pro slavery. Anyone who thinks differently is a fool. Crappy cheap monuments all purchased by the daughters of the conferacy. LOSERS!